This piece of Brickercup vs Boomercup fanart, which is part of my dearest BrickercupMasterX3’s Boomercup month, is dedicated to Tayler D. aka Taydrewa7x who celebrated her birthday three days ago, Lea Moncada aka zeetrip and Kazu aka KazunaPikachu who celebrated their birthdays two days ago, and WILDO aka Webfriends246 who celebrated her birthday yesterday. So, Tayler, Lea, Kazu, Wildo, I hope you lovely ladies had such awesome, wonderful, charming, dazzling, and grand birthday celebrations. I wish you a lot of love, joy, abundance, and happiness in your lives as artists and as people. This is also dedicated to all of the Brickercup and Boomercup shippers out there. So, do enjoy and soak up that Brickercup and Boomercup goodness. What happens when you have a seventeen-year-old basketball star who was dubbed as one of the most popular and well-rounded boys in school and his seventeen-year-old brother who is younger than him by a month, is a soccer star, and was deemed as one of the most lovable and talented boys to grace Townsville High, eyeing for a sixteen-year-old volleyball star who had such a fiery and tough reputation when she was a schoolgirl? 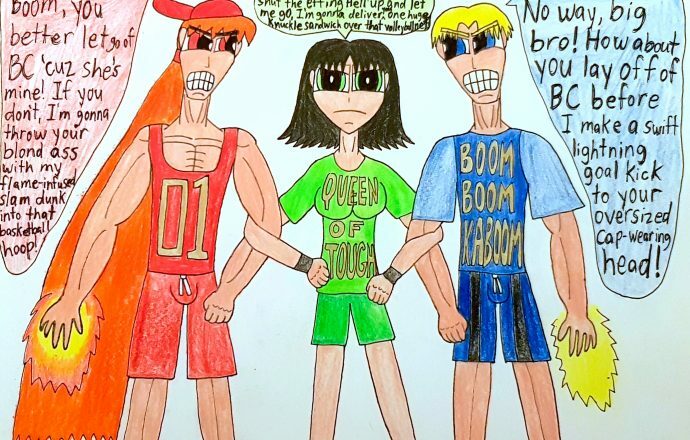 Why you would get a sport pun-filled high school love triangle, as Brick, Boomer, and Buttercup were Townsville High’s MVPs of the basketball, soccer, and volleyball teams back in 2009 when they were eleventh graders. Sure, Brick and Boomer are rather possessive of Buttercup, but as you can obviously tell, she is not enjoying this. Sometimes she even wonders why these two gentlemen would ever fall in love with her in the first place and she is no damsel in distress by any stretch of the imagination. Well, I hope you all enjoyed this. If you to ask me which Buttercup-centered pairing I prefer to have as my OTP and which one I prefer to have as my cute, innocent pairing, the answer should be clear as night and day. However, I would love to know from you guys if you prefer Brickercup or Boomercup via comments, as I am sure I will get some pretty interesting answers. So, dear viewers, until the next submission. 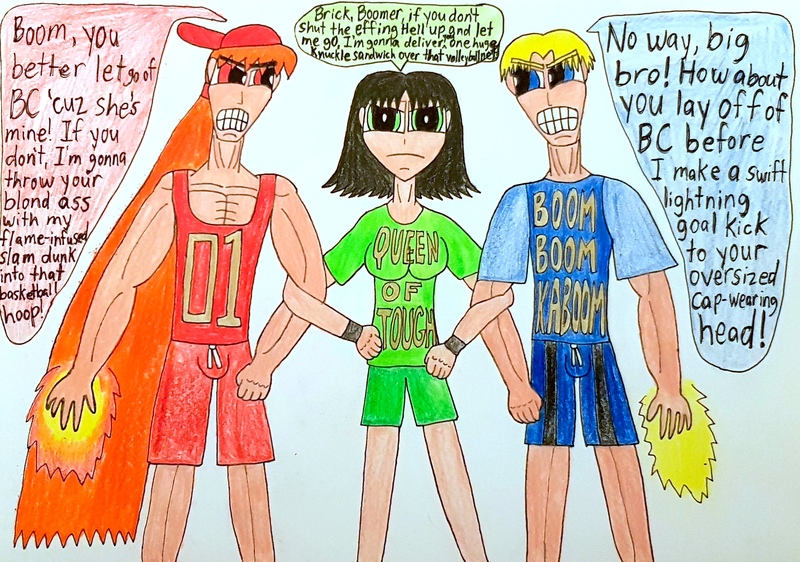 Brick, Buttercup, and Boomer from The Powerpuff Girls belong to Craig McCracken and Cartoon Network.